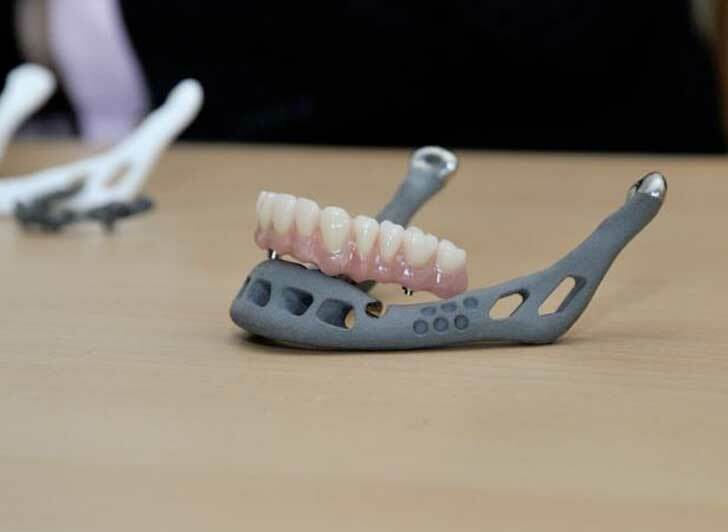 A new procedure using a 3D printed titanium implant could save people suffering disfigurement from jaw tumours. Until now, jaw tumours could necessitate the removal of a section of the jaw through an incision on the side of the face that could be up to four inches long. A piece of bone taken from the leg or hip would then be grafted in to the space. This procedure is a serious undertaking and the patient spends two days in intensive care and two weeks in hospital. Inevitably it leaves a major scar and this can affect the patient’s self-esteem for the rest of their life. There is simply no way to hide a major scar on your face and this kind of surgery can leave a lasting impact. With the new procedure, a CT scan is taken of the whole jaw and the diseased part of the bone is then removed through the mouth, rather than an incision in the face itself. The surgeon installs a temporary implant, while a mould of the jaw is modelled from titanium and 3D printed for a perfect fit. A follow up operation is carried out with two small incisions, one in front of the ear and the other underneath the chin. This helps the surgeon slide in and position a titanium plate that fits snugly against the jaw and essentially reinforces the whole weakened jawbone. Some patients require one more operation for dental implants. This system is less invasive and leaves far less scarring. By its very nature, the jawbone reinforcement gives the patient a complete facial structure back, too. So many people have been saved from serious disfigurement, which can go far beyond the simple scarring of a long incision. These people will potentially get a new lease of life from this new approach. Consultant maxillofacial surgeon Luka Cascarini is the man behind the procedure and he carried out the first four operations at Guy’s and St Thomas’ Hospital London. Cascarini believes up to 300 patients a year benefit from this new procedure. It’s just the start of a potentially exciting new branch of science where all manner of bone disease can be treated with titanium replacements that are tailor-made to the individual. Bioglass is also an option in some cases and this can encourage the regrowth of the bone around it to create a next generation graft that will actually repair the damaged tissue. These are exciting times in the medical world and now the Food and Drug Administration in the US has embraced 3D printing, the progress should get even faster. Bone implants are just one application and we could soon see full organ transplants with 3D printed parts that are personalised for the individual. Other institutions have produced jaw implants and the first one was fitted in 2012, but that was a complete replacement that could not help sufferers of tumours avoid major scarring. This one can. This is just breathtaking science at work. We’re happy to have a ringside seat as 3D printing changes the face of the world we live in and the people on it.